A business trip to Ashville NC and some warm spring weather provided all the excuse needed to tackle my first confluence in the Tarheel state. A 450 mile drive brought me over the eastern continental divide, and through Swannanoa and Black Mountain on Interstate Highway 40. I exited on U.S. 70 at Old Fort, then turned north on U.S. 221 just above Marion. I first traveled this road 44 years ago, and my vague recollection is of an area more rural and remote than the resort area I found today. Just before driving under the Blue Ridge Parkway, I passed up a chance to revisit one of my favorite spots in North Carolina, the nearby lovely Linville Falls. A little further (about 20 miles) up the Parkway is a stretch of real estate I came to know very well back in the summer of 1978 while finishing third in the Grandfather Mountain Marathon. All of which is to say there are a number of interesting destinations in the same locality as 36N 82W. Five years ago, the initial visit to this cp approached from the northeast to avoid a steep uphill climb. Not appreciating how out of shape I was following a winter of inactivity, I choose to come from the southwest. From U.S. 221, I turned northwest onto a curvy section of State Highway 194, then headed southwest as the road began to parallel Threemile Creek. I turned right on Mullin Hill Road, which I followed for about a mile and a half into the Clear Creek drainage. I pulled over when the GPS indicated I was about a half mile South-Southwest from the cp. According to my map, if I followed the road any further, it would just make my assent even steeper. While I was getting my bearings, a car approached and a young lady stopped to check her mailbox. I told her I was hoping to get permission to visit a spot up the hill in the woods, and while I was about to go into my DCP song and dance, she replied it was her family’s land, and, pulling away, said she didn’t see any problem. She yelled back to be careful and not get run over by an all terrain vehicle. The hike on the 40-degree slope was harder than I had expected, and I frequently consulted the GPS, only as an excuse to stop and catch my breath! Whenever I came across an uphill trail, I found myself taking it for a ways, even if it took me further away from the cp. When I reached 3600 feet elevation, I started working my way towards the point. 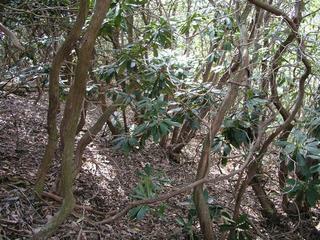 As reported on the earlier visit, by the time I was within 500 feet, I was surrounded by thick rhododendrons. About every two steps, I was forced to stop and hold the GPS high over my head, then check it again, and take another few steps. By the time the reading got under 150 feet, I was badly scratched and very frustrated. Out of the corner of my eye, I saw what appeared to be daylight. Stumbling in that direction, all of a sudden I came out on the high side, and three feet above, a new road cut. All of the vegetation from this project, large and small, had been pushed to the downhill side, and, as I discovered after taking a few steps, pushed almost directly on top of the point 36N 82W! This tangle of trees and brush proved impenetrable from the road shoulder. Walking the road east to the next drainage, I was able to work my way downhill pass a large natural overhang rock shelter, across a small stream, and reach a confluence point that from the north still appears pristine. What a difference 20 feet makes! I was not expecting such a dramatic difference since this site’s only previous visit four years ago. As I also discovered two weeks earlier at 40N 105W, development may be hard at work to put a number of American confluences literally "in someone’s back yard," but this may not be a good thing for folks who see confluence hunting as a great way to commune with nature… After taking a number of photos, I followed the new path of civilization most of the way down the hill until cutting over to retrace my route back to my truck. My heart beat and perspiration level returned to a more normal rate on the downhill leg of my journey. I made it back to my hotel in Asheville just before dark, at the end of what had turned out to be a rather full day. #1: A confluence point among the rhododendrons. #2: Clockwise from the upper left: Looking N, E, S, & W.
#3: Less than 20 feet from a fresh road cut, the GPS zeroed out under a cover of leaves. #4: Somewhere under this cover of impenetrable slash bulldozed downhill from this road cut sits 36N 82W. #5: The nearby picturesque mountain spring photographed in 2001 is now a PVC pipe at the edge of a road cut. #6: The new road makes a switchback just east of the cp. Walking down this drainage is a relatively easy way to reach 36N 82W. #7: Walking uphill on this new road cut would bring you to within 20 feet of this cp. #8: A newly cleared road at 36N 82W has opened up the view to the southwest, towards the Appalachian Trail. #9: This parking spot on Mullins Hill Road is a half mile away from, and 900 feet lower than, the cp. #10: 36N 82W sits southwest of the high point of Buck Hill, seen here from 1.5 miles away from Highway 194.